Have you ever wondered what Jesus was talking about when he told us we could cast mountains into the sea? Have you ever wondered about the point of having faith like a mustard seed? Hebrews 11:6 says that without faith it is impossible to please God, but yet so many of us have little idea what this means exactly. Jesus said if we had faith as a mustard seed, we could speak to our mountainous problems and cast them into the sea. Loaded with Scripture, this quick listen contains practical tips that you can immediately apply to your personal life, and start casting your mountains into the sea! Increase Your Faith was written to provide you with spiritual guidance and usable insights to help you see the impossible come about in your life. Exactly what you are hoping for and expect! This book is EXACTLY what the title says it will be - it's a practical guide to increasing your faith. It has some great examples of steps you can take, has great stories, has tons of scripture in it - you can tell that the author DEEPLY loves and reveres scripture - and, perhaps most importantly, takes a thoroughly balanced and biblical view of faith. What does Steve Bremner bring to the story that you wouldn’t experience if you just read the book? The author has a very, very soothing voice. Listening to him narrate anything is a bit of a "Calgon, take me away!" type of experience. There were many quotable moments in the book - it's hard to pick just one. I found myself pausing and rewinding several times just to make sure I caught something. It was a very easy and highly practical listen. Thanks for this book! It's a real gift to those who, like me, have a strong desire to be "believing believers" and who, while rejecting "name it and claim it" type theology also want to take what Jesus said as absolute truth. Again- very balanced, very biblical, very practical. I highly recommend this book for anyone looking to increase their faith in any season. It’s great for someone new in their faith because Steve presents foundational scripture references to build solid ground for those who need grounding in biblical faith. It’s great for someone in a crisis of faith season to remind them that they can call on the promises of God and bring them into their reality. It’s great for someone who has been around he block in their walk with God because we all need renewal and refilling of our spiritual wells. I love that it is compact, yet full of impact. I highly recommend it. This book will stir up your faith. 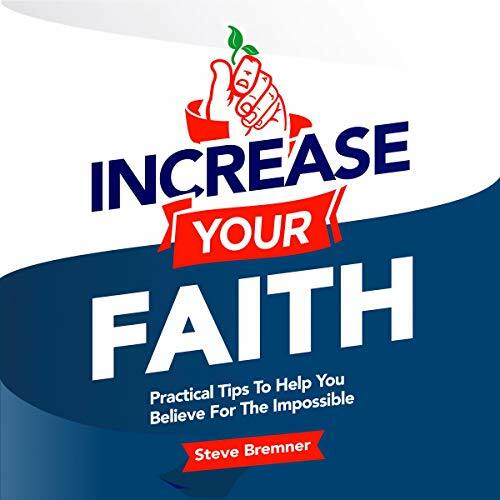 Steve Bremner's book, Increase Your Faith is a well written, plain-spoken, primer on faith. He begins with the disciple's request of Jesus, "Lord, increase our faith." From there he goes on to look in detail, from a Biblical perspective, at how faith can grow. Using Bible stories, personal anecdotes and the testimony of others, Steve clearly shows how faith can grow. From the scriptures, he makes the imperative for growing our faith clear. And using clear, real-life examples he helps us see the importance of growing our faith. I highly recommend this book. Steve speaks in a way that makes the Bible understandable for one who is young in the faith. At the same time, he brings encouragement for those who have been in the faith for years. Contrary to a lot of other "faith" books out there on the market, this is more than just a standard "name it and claim it" book. This is a biblical, true, and helpful approach to growing faith that is more than just talk. Steve's approach to building faith begins with showing us what it means to walk in faith, not just say something you intellectually believe. This alone should make it recommended reading on the subject. From there he moves to a practical plan for building true faith that revolves around knowing, digesting, and contending in faith for God's promises. He shares stories about how this plan has worked in both his life and the lives of others. Steve's plan is simple and doable by many people. I would encourage anyone who needs an upgrade in faith to give this plan serious consideration. I love books narrated by their authors. I feel like the author's voice communicates so much more of their message than a stranger's. Steve's reading of his book is no exception. Not only do you get to hear Steve's words in Steve's voice, but you can tell Steve has gained faith and conviction in the path he lays out for growing your faith. God's faithfulness has birthed faith in Steve and it's evident in his reading. Lastly, this book came at a time where I needed a boost in my walk with the Lord. I was incredibly helped by this book to fill my heart with God's vision for my life and continue to build up my faith for what that is to look like. If you're in a similar place or just want more real faith moving in your life, I would recommend this book. Would you consider the audio edition of Increase Your Faith to be better than the print version? This audiobook was a well-conceived presentation that inspired and provided practical steps for my spiritual growth. It was pleasant to listen to and incredibly engaging. This is a biblical teaching, not a novel. So, it does not have characters in that sense. Nevertheless, Steve was something of a "character" in this work. I enjoyed hearing about his experiences and insights. What about Steve Bremner’s performance did you like? Steve has a smooth, pleasant voice that lends itself well to an audiobook. I could easily listen to him read a number of different works. Yes, I could have listened to this work straight through if I had a little more time. It is well-conceived and finely produced. This teaching will help you grow in your relationship with God. I highly recommend it. What made the experience of listening to Increase Your Faith the most enjoyable? I enjoyed the stories of how the author took these steps in his own life and experienced the results first hand. Have you listened to any of Steve Bremner’s other performances before? How does this one compare? Not a particular moment - the book was a thought-provoking challenge all the way through. The author has clearly practiced what he is preaching and that is very encouraging. I gave the performance 4 stars as there were a couple of errors in the editing process with a couple of repeats. I will contact the author privately, and I'm sure that the author will correct these asap. They were very small and did not detract from the entirety of the work.